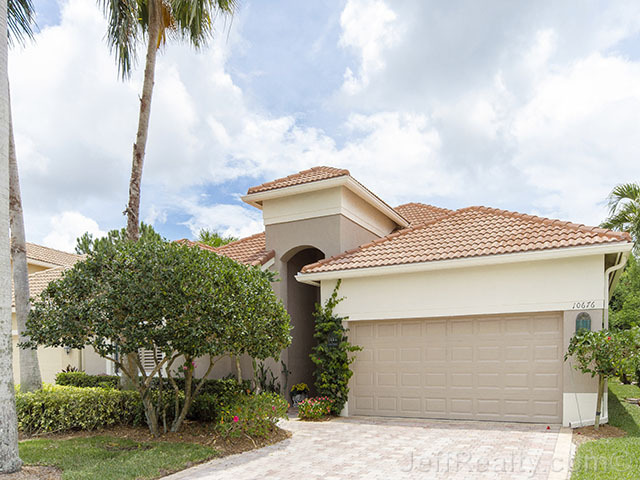 This superb 3BR/2BA home at 10676 Grande Boulevard in Ibis Golf & Country Club has it all; high ceilings, tiles on the diagonal, and a unique water view outside the extended, screened lanai. 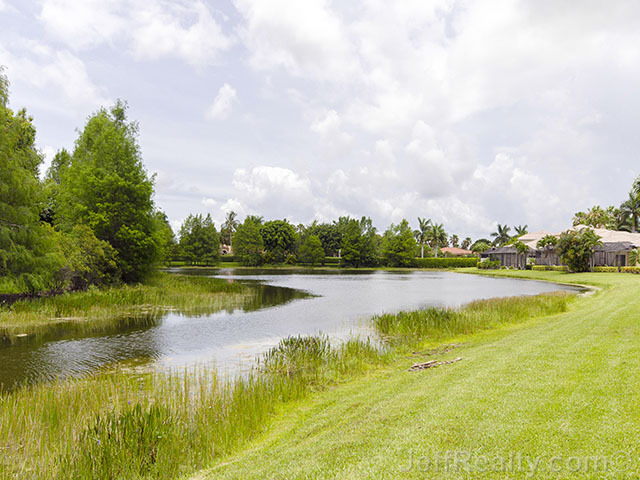 Gorgeous, lush cypress trees across the water lend a soothing, pastoral sense to this homesite. As you approach the home, colorful bougainvillaea and crown of thorns roses line the arched entrance and hint at the warmth of the home to be discovered inside. The foyer bursts with a beautiful claret color, drawing you into this great room home. Open, bright, and welcoming, this great room provides ample space to gather, as well as beautiful lake views. The built-in in the great room is the entertainment centerpiece. A decorative niche invites you into an extra-large kitchen, a cook’s dream! With Corian counters, many cabinets, and available seating at the counter, it overlooks the great room and the dining area. Easy conversation with the chef in the kitchen completes the sense of camaraderie in this home. The master has a view of the water, new carpeting, and California closets. The master bathroom offers double sinks, a Roman tub with glass blocks above it for privacy, and its soft peach color complements the general warmth of the home. The 2nd bedroom features plantation shutters and is very bright & cheery. The 3rd bedroom is set up as a den/office and has wood floors. A beautiful, screened-in patio with brick pavers overlooks a beautiful, lush, green preserve with water views. Posted in Ibis, Ibis homes, Ibis homes for sale on June 26, 2014 at 10:06 am.